Ovarian cancer is a malignant tumour of the cells on the surface of the ovary. This tumour is rare (12-15 cases per 100 000 women per year) but is often more aggressive than the other cancers of the female organs. The risk of ovarian cancer derives from the fact that cancer cells may detach from the ovary and freely spread (metastasise) in the abdominal cavity. Subsequently, these cancer cells can attach to the peritoneum and form cancer implants (metastases). Because early ovarian cancer hardly gives any symptoms, diagnosis is often late, at a time when there are already metastases on the peritoneum. What are the healing chances? The healing chances depend on how far the disease has spread. When the tumour is confined to the ovaries, the chances that the patient is still alive after 5 years are on average 85%. When the tumour has spread in the pelvis, the chances that the patient is still alive after 5 years are on average 50%. When the tumour has spread into the entire abdominal cavity (peritoneal cancer), the chances that the patient is still alive after 5 years are on average 35%, but range from 28-75% depending on the completeness of removal of the tumour (see below). When the tumour has spread outside the peritoneum (e.g. to the lungs or to the liver), the chances that the patient is still alive after 5 years are on average 5%. All these figures are only averages and are influenced by many factors. A best estimate for an individual patient can only be made by the physician based on the entire medical file. In many patients with advanced ovarian cancer, the metastases long remain confined to the peritoneum. Only at a late stage, metastases can appear in the liver or the lungs. Hence much research is put into improving the regional treatment of ovarian cancer, in other words a treatment that is focused on the peritoneal metastases. This is where HIPEC (OVHIPEC) comes in (see further). What are the consequences of peritoneal cancer? -Formation of ascites (fluid accumulation in the abdominal cavity). 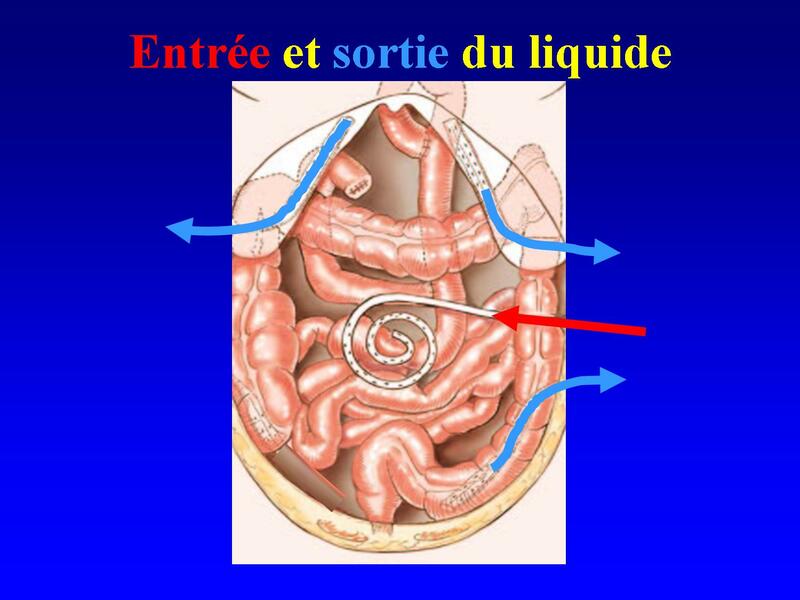 In every healthy person, a small amount of fluid is present in the abdominal cavity, to facilitate the smooth gliding of the small bowel. This fluid is being produced continuously, especially by the peritoneum of the small bowel, and is being absorbed continuously as well, especially by the peritoneum of the underside of the diaphragm (respiratory muscle between the thoracic cavity and the abdominal cavity) and by the peritoneum of the omentum (an ‘apron’ of fatty tissue which is attached to the stomach and which lies over the small bowel). In peritoneal cancer, there can be an imbalance between production and absorption of fluid, e.g. by blocking of the absorption by the tumour implants, resulting in ascites. The patient notices that she is rapidly gaining weight and that the abdomen is tense and swollen. The tumour implants can cause the small bowel to stick to itself and to the abdominal wall, reducing mobility of the bowel and causing sharp angles. The tumour implants at the outside of the bowel can compress the bowel by their volume and block the passage of the bowel contents. This results in abdominal cramps, vomiting, absent passage of gas and stools, and a swollen abdomen. The standard treatment for ovarian cancer consists of the combination of surgery and intravenous chemotherapy. The complete removal (debulking) of all tumour foci is the cornerstone of the treatment of ovarian cancer. The operation includes at least the removal of the uterus and ovaries, removal of the lymph nodes and the removal of the omentum (‘apron’ of fatty tissue which is attached to the stomach and which lies over the small bowel; this structure often contains metastases and is therefore always removed as a precaution). Often, the ovarian cancer has already spread to the rest of the abdominal cavity. The removal of all implants often requires a lengthy operation during which it is sometimes necessary to remove parts of the large intestine (colon) or of the small intestine or to fully remove organs such as the gallbladder or the spleen. All affected areas of the peritoneum are removed. This is often performed at the level of the abdominal wall, the bladder and the diaphragm (breathing muscle between the chest cavity and abdominal cavity). In other places, such as on the liver capsule, tumour implants are coagulated (burnt away). Surgery for ovarian cancer is almost always followed by intravenous chemotherapy (chemotherapy through a drip) unless in some patients with stage I disease with a low risk of relapse. Standard chemotherapy consists of a combination of a platinum derivative (such as carboplatin) and a taxane (made from the yew) (paclitaxel). Ovarian cancer is usually very sensitive to the initial intravenous chemotherapy. Unfortunately, it will relapse in a large number of patients, especially if not all tumour was removed by surgery. Primary debulking or interval debulking? The sequence of surgery and chemotherapy depends on the extent of the tumour. When a laparoscopy (keyhole surgery) shows that all tumour implants can be removed in one operation, a 'primary debulking' is performed, followed by intravenous chemotherapy (typically 6 courses). If a laparoscopy shows that the tumour is too extensive, or if there is a significant amount of ascites (abdominal fluid), the tumour will first be shrunk by intravenous chemotherapy (typically 3 courses). This is followed by an 'interval debulking' and completed by a new series of chemotherapy ( typically three courses). An 'interval debulking' strategy increases the probability that the surgeon will be able to remove all tumour implants of an advanced ovarian cancer. It also reduces the risk of surgical complications. The HIPEC (OVHIPEC) treatment of ovarian cancer consists of the standard treatment (surgery combined with intravenous chemotherapy), to which an abdominal rinsing with heated chemotherapy is added. What is a HIPEC (OVHIPEC)? HIPEC stands for: Hyperthermic IntraPEritoneal Chemotherapy, which means: rinsing of the abdominal cavity with heated chemotherapy. OVHIPEC stands for the application of HIPEC in ovarian cancer. This surgical treatment consists of three different phases: exploration, debulking and the chemotherapy itself. After all visible tumour has been removed, the abdominal cavity is rinsed with heated chemotherapy. Tubes are applied in the abdominal cavity to bring heated fluid from a reservoir to the abdomen and to aspirate it again in a closed circuit. As soon as the desired temperature has been reached, the chemotherapy is being added to the fluid. For ovarian cancer, Cisplatin is used at 40.5° Celsius during 90 minutes. What is the aim of rinsing the abdominal cavity with heated chemotherapy? The rinsing of the abdominal cavity with heated chemotherapy aims to kill the microscopic tumour implants, that are invisible to the naked eye, and that remain after removal of the visible tumour. Chemotherapy which has been poured into the abdominal cavity hardly leaves the abdomen, causing much less secondary effects to the rest of the body than when the same dose of chemotherapy is given intravenously. This way, a much higher amount of chemotherapy can be given, exposing tumour cells to drug concentrations that are up to 100 times higher than for intravenous chemotherapy. Furthermore, by heating this chemotherapy to temperatures between 41-43° Celsius, the tumour-killing effect is increased as well as the depth of penetration into the small tumour remnants. After the intervention, the patient stays about three days in the intensive care unit before going to the surgical ward. It usually lasts about two weeks before the patient can eat normally. The evacuation of the stomach is being disturbed for some time after a HIPEC (OVHIPEC). Food is being administered temporarily with a feeding tube directly into the small bowel, which regains its normal function more rapidly than the stomach. Total hospitalisation lasts about 2 to 4 weeks. Its duration is determined mainly by the time of restoration of normal stomach evacuation. A HIPEC (OVHIPEC) is a major operation which requires a lot of physical and psychological energy from the patient. A lot of patients feel very tired during about three months. Appetite can be lowered in this period. Moments of depression are not unusual. A high prior motivation, correct information, and a good support by the family, the surgeon, the general practitioner, the dietician and the physiotherapist are very important. After three months, quality of life returns to the level prior to the operation. After a HIPEC (OVHIPEC), complications occur in about 30% of patients. -Complications that are possible after any surgical intervention, such as infection or bleeding, can occur after a HIPEC (OVHIPEC) too. °An increased risk of leakage of bowel junctions (anastomoses) due to the heated chemotherapy. In case of increased risk of leakage, the surgeon can judge that it is safer to temporarily create a stoma (the bowel is exteriorised through the abdominal wall). °fluid accumulation in the pleural cavity (the space between the lungs and the thoracic cage), especially when tumour was removed from the diaphragm. In case of tumour at the diaphragm, the surgeon will put a tube (thoracic drain) in the thorax as a preventive measure to drain any fluid after the operation for some days. -Complications of the chemotherapy itself (lowering of white blood cell count, lowering of platelet count) can occur after a HIPEC (OVHIPEC) but are usually rare. What is the treatment after a HIPEC (OVHIPEC)? During hospitalisation and after returning home, the patient receives physical revalidation therapy for several weeks, which has a positive influence on recovery after this heavy operation. The patient is frequently seen at the outpatient clinic to monitor the recovery, to progressively adapt the diet, to provide answers to various questions, and to offer a psychological support. When the patient has recovered sufficiently both physically and psychologically after the intervention, generally an intravenous chemotherapy is given for 6 months. Follow-up examinations (tumour marker, CT scan) are planned on a regular basis. Is a HIPEC (OVHIPEC) treatment for ovarian cancer better than conventional treatment? This question can not currently be answered with scientific certainty. In a few years, the results of two international studies will clarify this issue. The study OVHIPEC-1 of the Nederlands Kanker Instituut in Amsterdam evaluates the potential benefit of adding a HIPEC (OVHIPEC) to an interval debulking (after prior intravenous chemotherapy). The study HIPEC-ROV of the University of New South Wales in Sydney evaluates the potential benefit of adding a HIPEC (OVHIPEC) to a new debulking for relapsed ovarian cancer. Nevertheless, there are currently three types of evidence that a HIPEC (OVHIPEC) treatment may be better than standard treatment for ovarian cancer. 1. HIPEC is useful for peritoneal cancer due to colon cancer. A 'randomized' comparative study (i.e. study of high scientific quality) from the Nederlands Kanker Instituut in Amsterdam in patients with peritoneal cancer due to colon cancer showed that patients who had undergone a HIPEC had a better survival when compared to the patients with a standard treatment. The 5 year survival was 45% for the HIPEC group if a macroscopically complete debulking could be achieved, compared to 9% for the conventional treatment (Verwaal, Ann Surg Oncol 2008). 2. Non heated chemotherapy into the abdomen is useful in ovarian cancer. Three 'randomized' comparative studies (i.e. studies of high scientific quality) in patients with ovarian cancer showed that 5 year survival increased by about 10% if the abdominal cavity was rinsed with chemotherapy for a few days to a few weeks after the debulking operation. The postoperative abdominal rinsing was performed via tubes that were inserted at the end of the operation. In contrast to a HIPEC (OVHIPEC), rinsing was not performed during the operation nor was the chemotherapy heated. Today we know that chemotherapy that is applied after the operation does not reach all sites of the abdominal cavity due to adhesions after surgery. Non heated chemotherapy is also less effective than heated chemotherapy. Despite this theoretically suboptimal performance of the abdominal rinsing, there still was still a positive effect on survival (Alberts, NEJM 1996, Markman, J Clin Oncol 2001; Armstrong, NEJM 2006). 3. HIPEC (OVHIPEC) is useful in advanced ovarian cancer (retrospective study). There is also a 'retrospective' comparative study (i.e. study of lower scientific quality) that compared a "real" HIPEC (OVHIPEC) with conventional treatment. The survival rate after 5 years was 30% better after HIPEC (OVHIPEC) treatment than after standard treatment (Ryu, Gynecol Oncol 2004). Retrospective studies must always be interpreted with caution. In summary, there are hopeful signs, but not yet definitive scientific proof that a HIPEC (OVHIPEC) improves survival in advanced ovarian cancer. The information on this page aims to provide general background information to patients with advanced ovarian cancer. This way, the patient can prepare the questions she wants to ask to the HIPEC surgeon, and she can read this text again after the visit to the surgeon at a convenient moment. Each patient with her disease however is unique; and the surgical and medical treatment of peritoneal cancer is evolving rapidly so that the information by your doctor or the treatment he proposes may differ slightly from this introductory background information. The information given by your doctor however always prevails on the explanation on this page.